Aviation Updates Philippines - An Airbus A320-200 of AirAsia Zest, operating as flight Z2 351, suffered deflated tires after boarding and loading cargo in Tagbilaran Airport, Bohol. This incident forced the airport to be closed on Sunday after it blocked the airport's runway. The airport was reopened today after the AirAsia Zest aircraft was removed from the runway. The airport closure cancelled several flights PR 2773, PR 2774, PR 2777, PR 2778, 5J 617 and 5J 618, flying between Tagbilaran and the Ninoy Aquino International Airport in Manila. “The problem was the flat tires. It happens,” Jenny Tan, communication officer of AirAsia Philippines, said over the phone when asked about the incident. This incident is normal due to short runway and the presence of potholes. 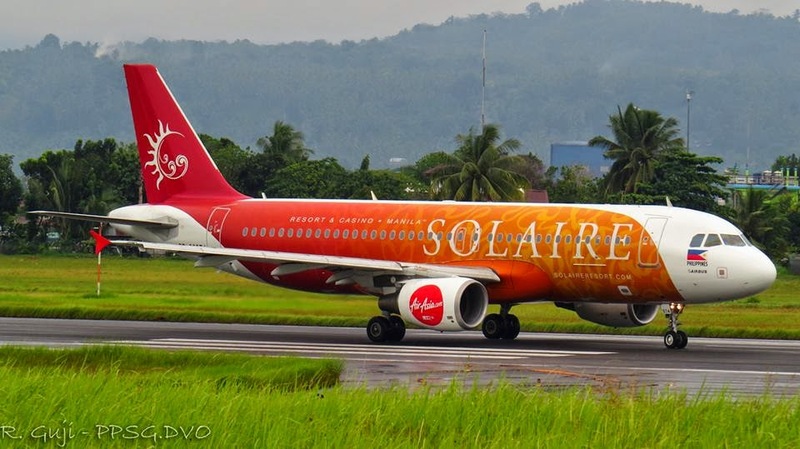 AirAsia Zest Airbus A320-216 RP-C8974 "The Solaire Livery"
AirAsia Zest personnel were able to fix the deflated tires on the same day but since the Tagbilaran airport is not equipped for landings and takeoffs after sunset, the plane was only able to take off for Manila at 6:57 AM on Monday, Tan said in a report by PDI. The Airbus A320-200 plane of AirAsia Zest, which is the joint venture of AirAsia Philippines and Zest Air, was carrying 178 passengers and 6 crew members. After the plane was removed, the airport resumed normal operations as scheduled. On the same day of the incident, an AirAsia Indonesia Airbus A320-216 loss contact with the air traffic control, 42 minutes after it departed from Juanda International Airport in Surabaya. The plane, carrying 162 passengers, is flying between Surabaya bound from Singapore operating as QZ 8501.